I decided almost immediately that The Curmudgeon’s Guide to Getting Ahead was a good book. Most objectivity went out the window with tip #2: “don’t use first names with people considerably older than you until asked, and sometimes not even then.” This has been a much-cherished “secret” of mine for a number of years, along with several other tips author Charles Murray shares for the younger set of ambitious professionals. Via the introduction, Murray explains that this book began as a series of brief posts on appropriate behavior in an office intranet page for interns and entry-level associates. The same topics were also discussed at home over dinner, with Murray’s wife and children. The ideas from those tidbits expanded into a book-sized collection, written for professional not-yet-curmudgeons. You are in or near your twenties. You are intelligent. It’s not essential that you have a college degree, but you probably do. Many of you attended a well-known college or university; some of you attended and elite one. You are ambitious — you daydream about becoming a CEO, a high-powered lawyer, head of the World Bank, Pulitzer Prize winner, or president of the United States. Most of Murray’s tips are simple and useful enough to stand alone with much exposition on his part. For many of these, Murray simply explains why the tips are useful when working with curmudgeons. 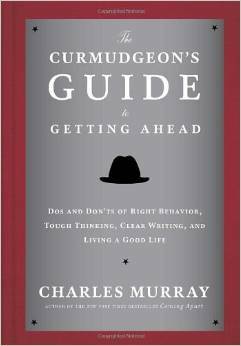 He describes curmudgeons as “highly successful people of both genders who are inwardly grumpy about many aspects of contemporary culture, make quick and pitiless judgements about your behavior in the workplace, and don’t hesitate to act on those judgements in deciding who gets promoted and who gets fired.” With that description, Murray also indirectly explains why a guide on how to behave around curmudgeons might be useful. Indeed, if you’ve spent any time working in any field other than IT or entertainment, you’ll be nodding your head in recognition from the second or third page. For the tips that take some unpacking, Murray is generally careful and precise without becoming overly preachy. For example, tip #27, “come to grips with with difference between being nice and being good.” This nugget gets a short treatment on “being nice” followed by a lengthy exploration of how that definition intersects with “being good.” Murray cites Greek and Aristotelian notions of morality and even dips his toes into Confucianism to flesh out the nuances of his explanation. Rather than drying out the subject, Murray’s commentary is both palatable and enjoyable to read. In contrast to much of the text, the section on “Thinking and Writing Well” is a chore to read. While Murray’s main points echo the concise common sense found in the rest of the book, his normally playful gravitas breaks down in this section. Paragraphs are dedicated to specific grammar and usage rules, Murray recommends several style manuals and reference books to collect immediately, and many pages are dedicated to tables of common errors by the grammatically careless. While basically true, his claim that the young and ambitious are judged on their use (or misuse) of the English language is so mired in a list of rules and regulations that it comes across as a pedantic pet peeve rather than a helpful or useful tip. Despite this hiccup, Murray’s The Curmudgeon’s Guide to Getting Ahead is a delightful snack-sized success manual. “Young” professional readers will appreciate the point of view, and recognize at least a few of their own supervisors in Murray’s descriptions of curmudgeonly reactions. Older readers will nod their head sagely in agreement with much of Murray’s text. I will most likely refer back to this book at some point in the future, and I will almost definitely recommend it to others. For that reason (and because I agree with about 90% of it) it gets a solid five Rae Reads stars – Permanent Library Collection. You can buy this book on Amazon in hardback or as an e-book. If you buy it from the link below I get some coin.